These Christian missionaries were exercising their constitutional rights to free speech and the free exercise of religion, but apparently the Constitution carries little weight in Dearborn, where the Muslim population seems to dominate the political apparatus. Somehow I don't think we've seen the last of such things. This is a video of an interview on FOX News of two of the men who were arrested, along with their lawyer. First, unlike the Old Covenant, everyone who is a member of the New Covenant community knows the Lord. Second, unlike the Old Covenant, everyone who is a member of the New Covenant has his sins forgiven. It is clear that when God says that all in the New Covenant will know Him, He does not just mean that they will know about Him, but rather that they will have a personal relationship with Him as believers who have been forgiven by Him. Nevertheless, there are two current errors that deny this fundamental teaching, either expressly or by implication. The first error is held – and has been held for centuries – by our Presbyterian brethren. This is the error that teaches that, like the Old Covenant community, the New Covenant community is made up not only of believers, but of believers and their children. This means that the New Covenant Church includes unbelievers and covenant breakers. But the problem with this view is that is treats the New Covenant like the Old Covenant in the precisely the way in which God said it would be different! For He clearly indicated that the New Covenant would differ from the Old in that it would be an unbreakable covenant consisting only of those who truly know Him. Now, I certainly do think we may have hope that children born to believers may indeed come to faith in Christ and thus become a part of the New Covenant community. But there is no such promise in Scripture. All we can do is pray for our children who have not yet come to know Christ and continue to lovingly share the Gospel with them, with the hope that God in His providence has placed them in our families for this very purpose. The second error is held by a small but growing minority of our Baptist brethren, even by some who would call themselves Reformed Baptists. 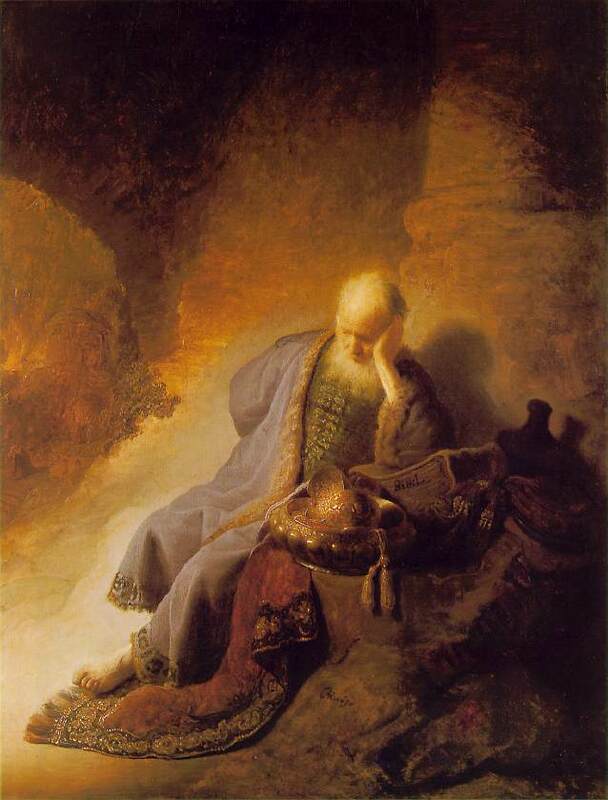 This error is remarkably similar to the previous one and teaches that the local church should be viewed as a “family of families.” But the problem with this view is that, as with the previous view, the Church is viewed as being like the Old Covenant community in the inclusion of our children, whether or not our children are believers. Now, some who describe the church this way would definitely not want to agree with the implications of the Presbyterian view. For example, Voddie Baucham has sought to distance himself from some of the errors associated with the "family of families" concept, here and here. He admits that the phrase is potentially problematic, and he is forthright about the way the terminology may lead or has led some to wrongly conclude that it is an attempt to describe the nature, rather than the ministry, of the church. However, even though he admits that this terminology – terminology which he and his church have helped to promote – is "enigmatic," I think he fails to see how much the terminology has been taken by many common advocates of the Family-Integrated Church Movement (FICM) themselves as descriptive of the nature of the Church, his own belated protestations notwithstanding. In addition, Scott Brown, another man who has done much to advance the "family of families" view of the church, has posted a series of articles responding to Reformed Baptist objections to this terminology. One of these articles is entitled The Church is a "Family of Families" -- Part 5 and is subtitled "What have we learned from this controversy over 'Family of Families'?" In this article Brown speaks to the way he believes FICM advocates have often been misunderstood and of the way the National Center For Family Integrated Churches (NCIFC) will make use of the phrase "family of families" in the future. Although he says that it no longer appears in current NCFIC literature and has been removed from their core document, "A Biblical Confession for Uniting Church and Family," he also states that, "We have no intention to abandon the use of the phrase or the concept behind it. It is a very important principle that undergirds a biblical understanding of church and family life." Thus while Brown obviously sees that the phrase "family of families" has been problematic when used as a descriptive term for the Church, so much so that it has been removed from all of the NCFIC literature, he nevertheless thinks that there is no need to abandon use of the phrase among FICM advocates. So we have a situation in which two of the leading voices of the FICM recognize the problem with the "family of families" terminology, but sadly neither are really willing to stop using it. I find this deeply troubling, since the phrase is clearly not just problematic because it leads guys like me to misunderstand them as making a statement about the nature of the Church when they really don't intend to do so, as Baucham suggests in the defense posted above. Rather it leads to problems among FICM advocates themselves, a number of whom I have encountered in pastoral ministry and who have clearly seen the term "family of families" as describing the nature of the Church. And, frankly, I can understand why they have thought so, since this is a hard conclusion to avoid given the nature and grammar of the phrase when tacked onto the sentence "The Church is." Thus, when they have consistently heard the motto, "The Church is a family of families," how does it not sound like an expression about the nature of the Church? And how, by the way, was such a problem with the language not foreseeable? I think we all know how a slogan can take on a life of its own, and this one has definitely done so. In addition there is often a strong, consistent, and Biblically unbalanced emphasis among FICM advocates upon the biological family that eclipses any emphasis upon the Church as a spiritual family, an emphasis that tends to reinforce the notion that the term "family of families" is indeed descriptive of the nature of the Church. So confusion is rampant, and astonishingly the blame for the confusion is usually placed by them on those of us who disagree. But, again, we do not see the language as problematic just because it leads to a misunderstanding of their position by those on the outside who might be critical, but also because it leads many within the FICM movement to erroneous ideas about the Church. Yet we are still told that we are just being too critical and unwilling to listen attentively to the way they qualify the language. However, in my opinion, the confusion that has come about is their fault, for they are the ones who have employed such easily misunderstood language in the first place. And until FICM advocates such as Baucham and Brown are willing to reject such language entirely, this confusion will continue to reign among many (and guys like me will have to keep writing posts like this one). I will conclude by saying that this is more than a little disturbing to me as a pastor, whose primary objective is to help the Church understand God's Word better rather than to accept the obfuscation of important theological matters. And I have to say frankly that I just can't get my head around the idea of a pastor who does accept the use of such language, apparently just because he can't let go of a pet term no matter how truth-distorting it might be. Such a situation just makes me think that some of these men have lost sight of what is really important. In elevating an emphasis upon the biological family to a place of such central importance that it eclipses clear Biblical teaching about the true nature of the Church as a spiritual family, along with an unwillingness to state that matter in a fundamentally sound way, they may just be losing sight of some truly essential matters. For example, if the need to state important Biblical truths in a way that helps to promote clarity in understanding is not seen by them as being of grave importance, then they have got a bigger problem than we all might think. I, for one, think that stating Biblical truth in a clear and understandable way is always a crucial matter. And I think that seeking to avoid the use of language that distorts important Biblical teaching and easily leads to misunderstanding is equally important, don't you? Earlier today Chris Poe posted an interview with Jeffrey Johnson, author of The Fatal Flaw of the Theology Behind Infant Baptism. You can read it here. A team from the Center for the Study of New Testament Manuscripts (CSNTM) just returned from a month-long trip to Greece and Romania. They were in Athens, Meteora, and Kozani for the first two weeks (all in Greece); for the last two weeks, they were in Craiova, Iasi, and Bucharest (all in Romania). Remarkably, during this expedition they discovered at least ten New Testament manuscripts! Every time a new manuscript is discovered it becomes one more piece in the puzzle of the genealogical tree that all manuscripts are connected to. Each tells its own story, and every handwritten manuscript is a unique document—a witness to the original text. Among the manuscripts CSNTM discovered on this expedition is a seventh-century majuscule codex. There are a little more than 300 majuscule manuscripts of the New Testament, so this codex is in rare company. And manuscripts from the seventh century (600s) are very few in number. About 15–20% of all the New Testament manuscripts are from the first millennium. So, any manuscript from before AD 1000 is a real treat! 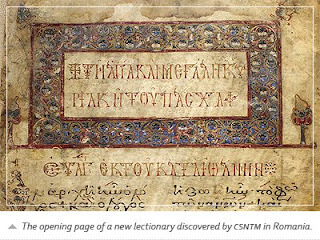 Another manuscript unknown to New Testament scholars was a very large lectionary from the eleventh century (see photo). Housed at the Museum of Art in Iasi, Romania, it is a magnificent volume. Weighing in at over 20 lbs., with exactly 800 pages of text, it’s no lightweight! In fact, this manuscript is the fourth longest and third largest lectionary from the eleventh century that exists today. The team from CSNTM photographed it using their new Graz Travelers Conservation Copy Stand. If you have an interest in New Testament textual criticism or just like to hear news about recent discoveries and issues, you may want to check out the Center for the Study of New Testament Manuscripts website. Although it has been two days since Memorial Day, I thought I would share some thoughts I had while celebrating that holiday this year, especially since there have been some recently who have questioned my patriotism due to my stance on the American Revolution. For, as regular readers of this blog already know, back in February I wrote an article entitled The American Revolution: Was it Biblical? in which I concluded that it was not Biblical and that Christians should not have taken part in it. Unfortunately, some Christians seem to think that this view somehow makes me less patriotic than I should be. So today I would just like to state something of my own view of patriotism as one who is both a Christian and an American citizen. I will begin by briefly explaining my understanding of the word patriotism and then deal with my understanding of what it means to be a Christian patriot. I understand the word patriotism basically to mean "love of country and willingness to sacrifice for it" (see here, for example). And, given this understanding, I would say that I am indeed a patriot with respect to two countries, my heavenly country and my earthly country, in that order. NKJ 1 Peter 2:11-17 Beloved, I beg you as sojourners and pilgrims, abstain from fleshly lusts which war against the soul, 2 having your conduct honorable among the Gentiles, that when they speak against you as evildoers, they may, by your good works which they observe, glorify God in the day of visitation. 13 Therefore submit yourselves to every ordinance of man for the Lord's sake, whether to the king as supreme, 14 or to governors, as to those who are sent by him for the punishment of evildoers and for the praise of those who do good. 15 For this is the will of God, that by doing good you may put to silence the ignorance of foolish men -- 16 as free, yet not using liberty as a cloak for vice, but as bondservants of God. 17 Honor all people. Love the brotherhood. Fear God. Honor the king. So, as a sojourner and pilgrim on this earth I am to be a good citizen who prays for and submits to those in authority for the sake of the Gospel and the glory of God. And this makes me a better citizen of my earthly country, not a worse one. Indeed, it means that I should be willing to show the love of Christ to and for my country, even to the point of sacrifice for the good of my country. Now, more than in past years, the enduring relevance of Memorial Day should be clearly evident. With two wars under way, the public has no excuse not to remember. This much is owed to the more than 5,400 Americans who have died thus far in Afghanistan and Iraq. Why is it, I wonder, that – in my experience at least – so many Christians today like to talk of their love of country, and perhaps question the patriotism of someone like myself, when they could apparently care less about the price that has been paid, and continues to be paid, by so many of our service men? These men gave what Lincoln called their "last full measure of devotion" for their country, and I suspect that, if more Christians had as much devotion for the Lord, they would be far better citizens than they are. I hope they would join me in seeking to be the kind of citizen and patriot that Jesus would have us be, one who, because he loves the Lord first, is also able to love his country in a self-sacrificing way. For a related article by Jeff Johnson, see Giving Uncle Sam His Due.